Nestled deep within the thick catalog of parenting jokes is the timeless image (read: groaner) of a frazzled adult poring over a child’s math homework and trying to figure out what “all those letters are for.” Well, they’re called variables. And they’re just one concept of many that could be more easily taught to children (and maybe frazzled parents) with the aide of hand gestures. A new study from the University of Chicago has found that children who are taught math with the use of supplementary hand gestures form more abstract and generalizable ideas about the specific lesson than kids who are taught by action alone. These are the kids who are taught rote input skills, such as filling in the blanks of an equation with the correct number. It makes for more flexible learning, along with deeper understanding, the researchers contend, when kids can put the abstract into visual form on their own. 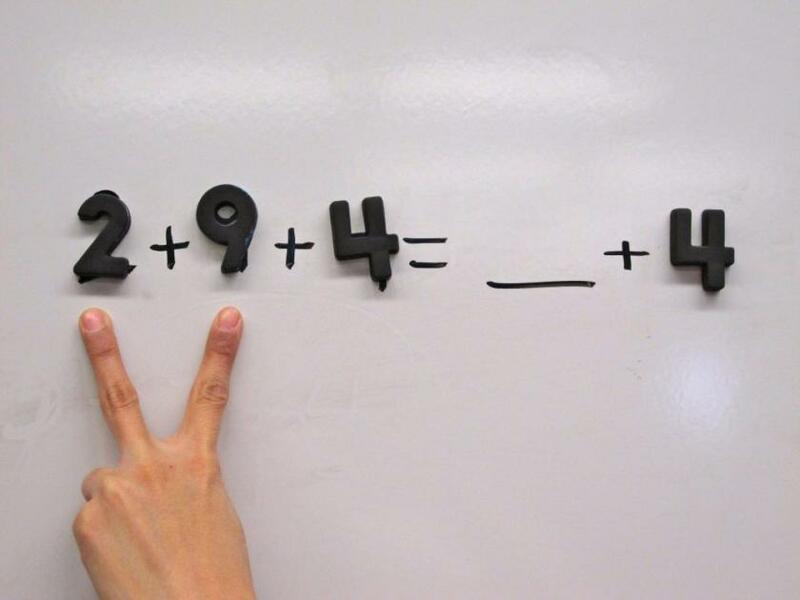 The technique in the study worked like this: A group of 90 third-graders were shown the equation 4 + 2 + 6 = ______ + 6. It was up to them to figure out which numbers belonged in the blank, and to test the hand gesture hypothesis the team relied on three strategies. One group of kids physically placed magnetic numbers onto the whiteboard where the equation was drawn. Another group mimed the action but never touched the numbers. The third group was told to use two fingers on one hand, in the shape of a peace sign, to signal which numbers belonged where, before pointing to the blank with their other hand. When it came to that specific equation, all three groups performed equally well. But that’s not what the team was testing for. The real test came later, when the experimenters had the kids figure out new math problems with the same methods. Here, the third group shined. The abilities they learned in the first experiment — metaphorical grouping, number relationships, spatial reasoning — built a bridge to future exercises. Rather than apply prescribed methods for a single equation, they used principles that were core to the lesson: gesturing, not acting, the team argued. “We found that acting gave children a relatively shallow understanding of a novel math concept, whereas gesturing led to deeper and more flexible learning,” explained the study’s lead author, Miriam A. Novack, in a University release. The technique relies on a method of education called "flexible learning," or, as it was known in more honest days, simply “learning.” Under the system, kids are exposed to the deeper mechanisms behind a certain lesson — math, generally, only because it’s easier to lose sight of math’s use value than writing or reading — as opposed to an automated series of steps that produces a result. In truth, flexible learning is core to one of the first things kids learn: reading. We were all taught not to memorize our favorite books, and instead to undertake the (far trickier) exercise of learning how letters sound and how to put them together. Math is no different. It’s a language all its own, but one that many students fail to learn because it’s taught the same way reading isn’t. “Our findings provide the first evidence that gesture not only supports learning a task at hand but, more importantly, leads to generalization beyond the task,” said senior author and professor of psychology, Susan Goldin-Meadow. The findings may be new, but the truth is that kids in the study used education for its true purpose: as a tool, which they carried with them even after the lesson had ended. It’s a poignant finding set against a backdrop of cheapening college degrees (in weight, not cost), testing standards, and the endless pursuit of the almighty A+. Students are, to borrow NYU sociologist Richard Arum’s phrase, “academically adrift” — getting loads of education under their belt without learning much of anything. For true learning, memorization simply fails. “Children appear to learn underlying principles from their actions only insofar as those actions can be interpreted symbolically,” Goldin-Meadow said. Or, to blunt the researcher’s articulate point: teach the subject, not the solution. Source: Novack M, Congdon E, Hemani-Lopez N, Goldin-Meadow S. From action to abstraction: Using the hands to learn math. Psychological Science. 2014.